Germany’s Christmas markets are a bucket list destination for many—and for good reason. There’s something magical about the twinkling lights, wooden stalls filled with local wares, Glockenspiels and the delicious warmth of Glühwein—the season’s traditional spiced mulled wine. The magic is amplified in Germany’s State of Thuringia, the place where many Christmas traditions began. Let’s explore this special region in eastern Germany—it’s a magical place that will put you in the holiday spirit like nowhere else. Martin Luther, the great Reformer, once declared that Erfurt is "in the ideal location…the perfect place for a city.” The capital of Thuringia, dates back more than 1,270 years. It’s truly a charming city in any season with its beautifully preserved old quarter, half-timbered buildings and the Merchants Bridge—a medieval bridge lined with shops and galleries displaying the work of local artisans. But when the holiday season arrives, Erfurt transforms into a spell-binding display of sights and sounds. In the heart of the city, Domplatz, is home to one of Germany’s largest Christmas markets. Set against the spectacular backdrop of the majestic St. Mary’s Cathedral and the Church of St. Severus, the welcoming aromas of spiced mulled wine, gingerbread and sausage fill the air as you wander through the town’s main square. Over 200 wooden huts display everything from candles to hand crafted toys to Christmas tree decorations. There’s also plenty to satisfy your appetite including regional favorites such as Thuringian bratwurst and Erfurt schittchen, a stollen so good it's been registered as a trademark. A UNESCO World Heritage site with 14 protected buildings, Weimar was home to many notable figures in history. Johann Wolfgang Goethe and Friedrich Schiller lived and wrote here, Johann Sebastian Bach played the organ, Franz Liszt was a music director, and Carl Maria von Weber composed. It’s the birthplace of Bauhaus—a revolution in design. And, in 1815, Weimar was the site of the first public Christmas tree erected in Germany. Bookseller Johann Wilhelm Hoffmann erected the first Christmas tree outside of his shop. His desire for the poor and orphaned children of Weimar to have a Christmas tree sparked a worldwide tradition. To commemorate his gesture, every year the elaborately decorated tree is erected on the market square to the accompaniment of Christmas carols performed by local choirs. A highlight of the Weimar Christmas market is the Gothic Weimar Town Hall. During the season, the 24 windows of the building are converted into a life-size Advent Calendar. Each day a window is opened by local children to discover a theme of the day at the market. You’ll also find a uniquely Weimar display on the wooden huts of the market—the onion plait. A nod to Weimar’s favorite vegetable celebrated each October at Zwiebelmarkt, the Onion Market. The festival began in 1635 as a “market for onions and beasts” and continues today. Attracting upwards of 350,000 visitors over three days, the Onion Market is the largest festival in Thuringia. Perched high on a mountaintop, the Wartburg Castle silently watches over the city of Eisenach below. Dating back as far as the Middle Ages, the castle is a blend of Gothic, Romanesque and Renaissance architecture. Centuries of history unfold within its ancient walls—many of which are decorated with mosaics, frescoes, and other expressions of German Romanticism. The castle sheltered Martin Luther while he translated the New Testament into German. No visit to Eisenach is complete without a trip up to the castle. But it is especially captivating during the Christmas market when the castle courtyards are filled with medieval musicians, performers and puppeteers while Advent concerts in the ceremonial hall evoke the holiday spirit. While the city markets will delight, a visit to the Thuringian Forest is essential to discover the place where so many Christmas traditions were born. Traditional wooden toys, dolls and stuffed animals have been made for centuries in Sonneberg—often referred to as “Santa’s other workshop.” The town still produces high quality toys and is also home to the German Toy Museum. Tucked into the Thüringer Schiefergebirge Mountains surrounded by forests you’ll find the small village of Lauscha. It was here that the first glass Christmas ornaments were created in the 16th century. Generations later, the original family still produces ornaments that are distributed around the world. I watched in amazement as the glassblowers transformed unlikely raw materials including sand and limestone into delicate masterpieces—and then I shopped. How could I resist so many beautiful things in one place? 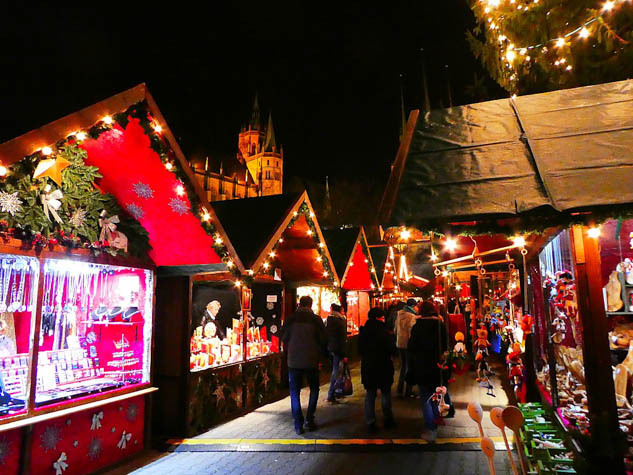 Have you experienced Germany’s Christmas markets?